The International Security Programs Benchmark Report presents and analyzes the findings of a broad survey conducted by the Security Executive Council of corporate international security programs. The report identifies the types of international security baseline programs in place for a range of company sizes, and describes the organizational perception of security’s role and capability. The data suggest that international security programs are greatly affected by the company size and the location of the security department within the organization, whether as part of the executive, legal, or human resources function. Security leaders can gain valuable insights from this report regarding the scope of international security programs at key corporations with contextualized comparison points for evaluating their own programs. 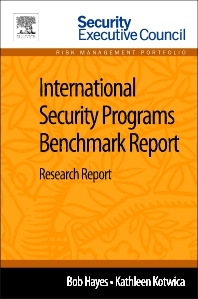 The International Security Programs Benchmark Report is a part of Elsevier’s Security Executive Council Risk Management Portfolio, a collection of real world solutions and "how-to" guidelines that equip executives, practitioners, and educators with proven information for successful security and risk management programs.